Dendrobium is an orchid growing on trees, with stem 15-20 cm long. 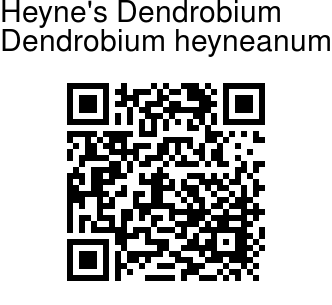 It is named for Dr B Heyne, German botanist and traveller. Leaves are 8-10 x 0.6-0.8 cm, linear, pointed, stalkless, sheathed at base. Flowers are white or pinkish-white, in 8-10 cm long, 10-12 flowered, slender in leaf-axils or at branch-ends racemes. Flower-stalk is 7 mm; dorsal sepal 9 x 2 mm, oblong-lanceshaped; pointed, 5-veined; lateral sepals 9 x 2.5 x 3 mm, obliquely ovate-lanceshaped, pointed, 5-veined; petals 9.5 x 1-1.5 mm, inverted-lanceshaped-linear, pointed, 3-veined; lip 12.5 x 4-6.5 mm, obovate, side lobes oblong-lanceshaped, pointed; midlobe, ovate, subpointed, apiculate, margins toothed; disc with a fleshy callus. 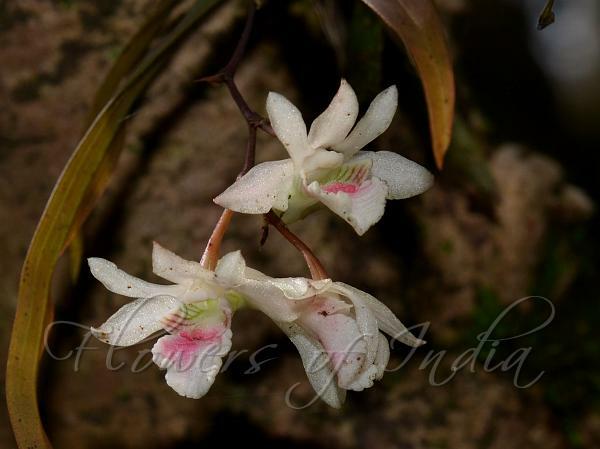 Heyne's Dendrobium is found in Peninsular India. Flowering: August-November. Identification credit: Ravee Bhat Photographed in Mudigere, Karnataka.